Morning after morning, I sipped on a cup of freshly roasted Ethiopian coffee. What a delightful and uplifting way to enjoy the early sun and plan out my day’s adventures. 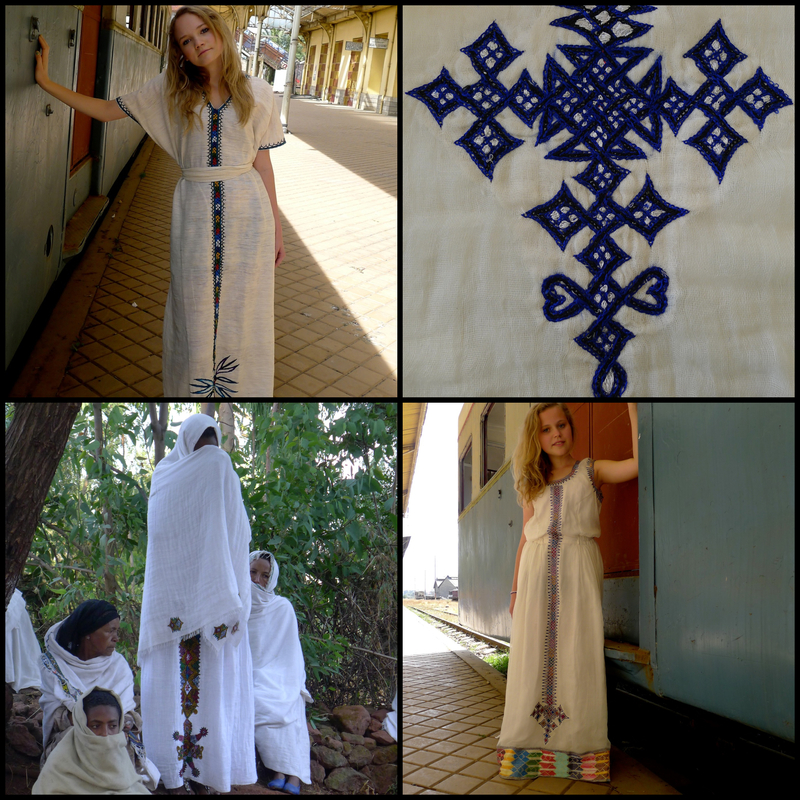 One of my many goals for this trip was to find makers of the Habesha Qemis or “coffee dress”. These special gowns are made by trained “shemane”, Ethiopian weavers. Their techniques are ancient—passed down from generation to generation as a way to keep the tradition of spinning the cloth and embroidering the fabric alive. 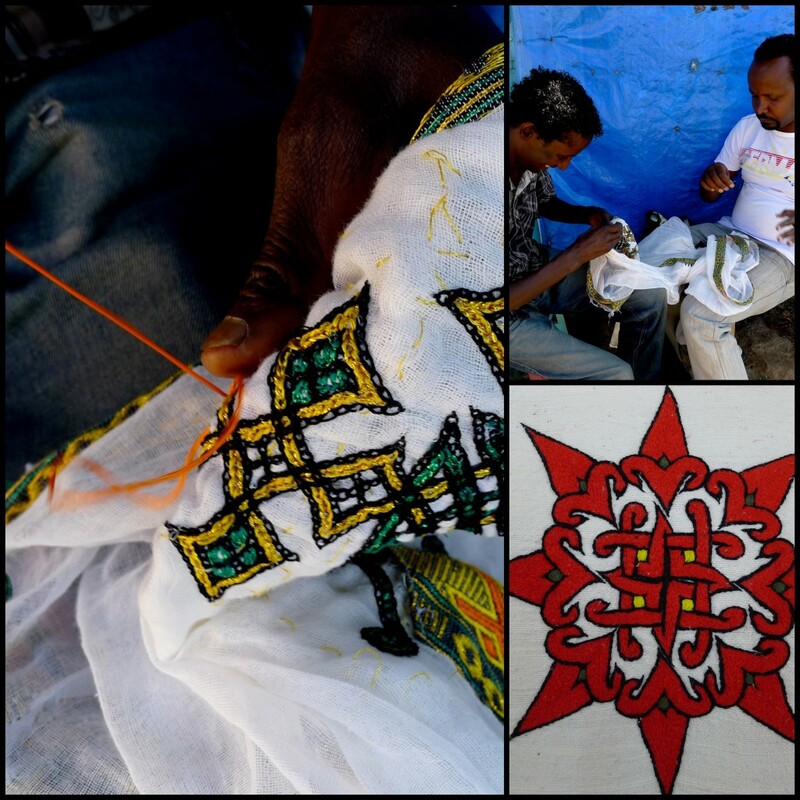 There is great meaning in each dress and every detail of the Habesha Qemis has importance. I had to find the source of this extraordinary process and I was determined to locate where Ethiopian people were creating these amazing dresses! by treating woman affected by HIV/AIDS with dignity and respect and by providing them with fair opportunities to support their families, they will be empowered and more able to contribute to their community. I fell in love instantly as I watch the women at work. 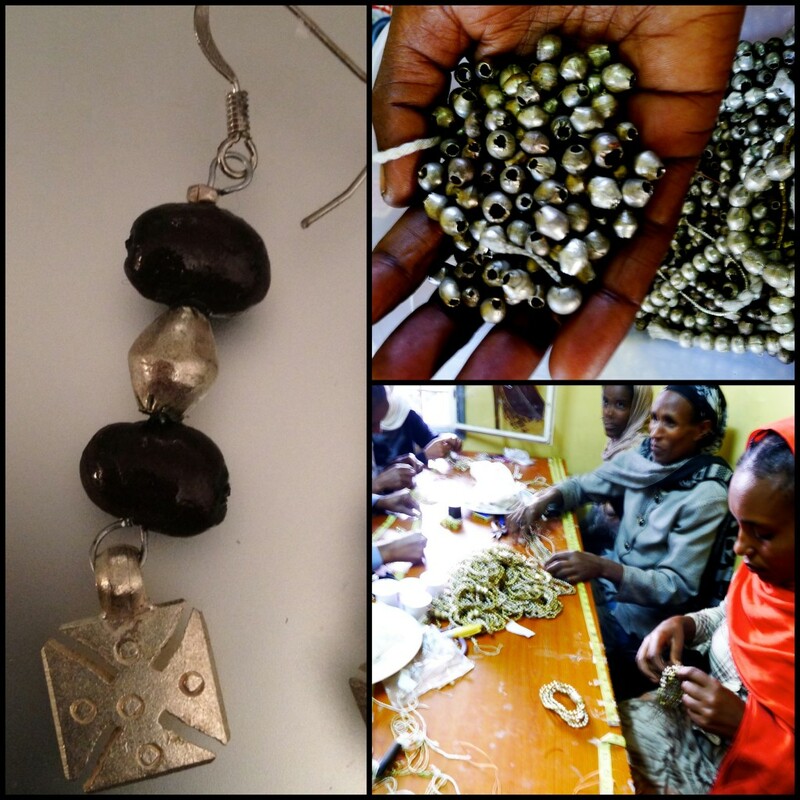 At Entoto Beth Artisans, they are trained to make jewelry from bullet casings and scarp metal discarded during military confrontation. They use natural resources like dark roasted coffee beans too. I felt extremely honored to see the craftsmanship and skill these women have for making jewelry. I could not leave without purchasing a pair of coffee bean earrings to share on From the World with Love. They are lovely—just like the women who made them and the beautiful county which they came from. I also met an amazing Canadian woman named Kathy. She has started her own hand-woven textile company. Making traditional Ethiopian silks and cottons, Kathy works with many local farmers and businesses to obtain the cotton and dyes she uses. All of her products are made on looms in her small workshop which has become the central space for many Ethiopian women to obtain jobs to support their families and the community. I was especially happy to hear that Kathy’s business, Sabahar Silks, is a part of the World Fair Trade Organization. A Visit to her workshop was the exact type of experience I was hoping to find while in Ethiopia! Each item is hand-made with love, using tradition and ethics! 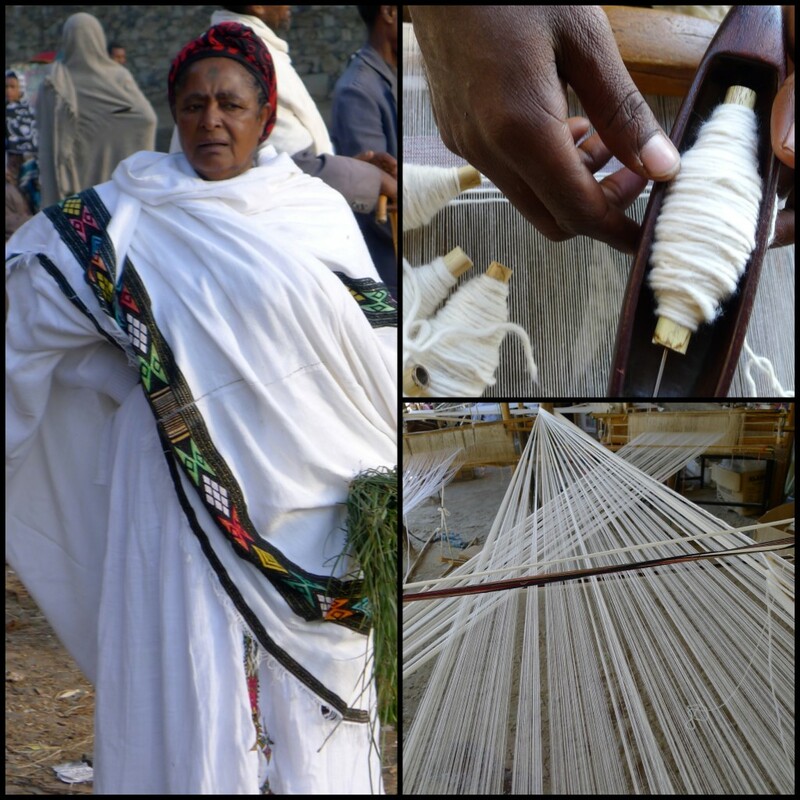 Most of the women I saw in the villages outside of the city, as well as in Addis were wearing shawls called netelas. I had the opportunity to meet with a few garment manufactures in different communities. One of the men I met does the embroidery work by hand! I have not seen a lot of embroidery work that can compare to what he does. It is easy to tell when the fabric is hand-made and when it is done with a machine, and the same goes for embroidery work. I found a few really nice dresses made from hand-woven cotton. Because they are woven and stitched with such care, each one has a special feel and unique quality unlike any other. The Shemma cloth is the fundemental part of every gown. The yarn is woven by hand on spinning looms that have been used for hundreds of years. I can’t image the work that goes into each piece from start to finish. It takes two or three weeks to make enough cloth for one dress! Once the starch white cotton is complete, the embroidery can begin. Watching each stich sewn by hand, each pattern created by memory—the finished product was more wonderful than I ever expected. Many of the Habesha Qemises I was admiring would be worn for special occasions like church, marriage and traditional ceremonies. I couldn’t help imagine wearing one myself! I met three beautiful young girls from Norway, Marte, Oda and Judith. They raised money for children in Ethiopia by fundraising through the Knarvikmila 10km Marathon. 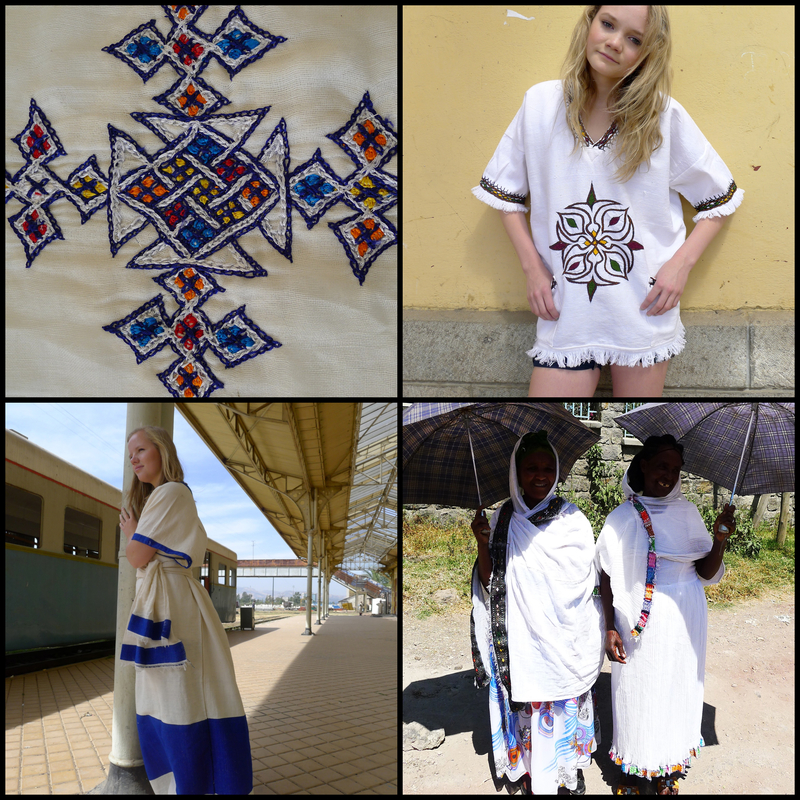 They looked just as beautiful in the shemma cloth as the women living in Ethiopia! Walking through the villages that surround Mount Entoto, I was amazed to see people doing embroidery work outside! This was like nothing you would find in any other busy city or industrialized area around the world. People were enjoying the view, the warm light and the beautiful weather, as they worked in peace throughout the day. From hand spinning the cloth, to weaving in colored threads, to adding the finishing touches of embroidery, I sat and watched as Habesha Qemises were made closer and closer to perfection. I remembered they day before, when I watched people gathering in the streets and walking towards the churches for the St.Michael’s Day celebrations. I’m sure many of the dresses worn that day were made by the people I was watching in that very moment! Never the less, all of the women had a different embroidered pattern on their gowns to show the uniqueness of each dress. The Habesha Qemis is like a work of art—the designs and colors change with from childhood to adult life to old age, resembling different stages of life and important moments. Along with the gowns, all of the women were decorated with bracelets and anklets. This made them look even more dazzling and beautiful, like the county of Ethiopia itself. Marte, Oda and Judith were happy to wear the dresses I purchased and they fit perfectly! We took photos at an old French train station in Lagar. 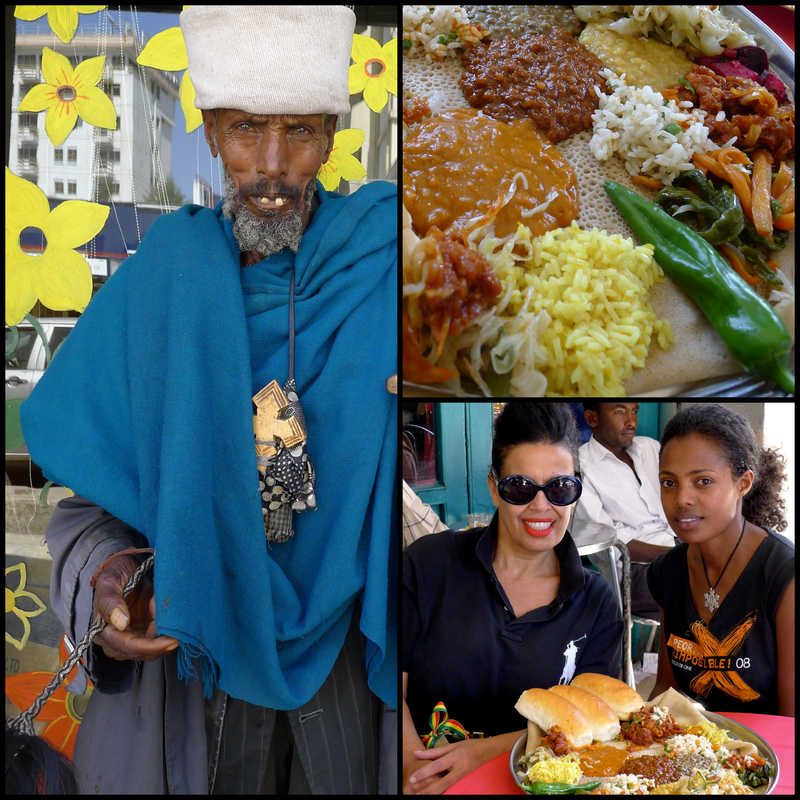 There was one place in Ethiopia that I felt passionate about experiencing. Mercato houses the biggest shopping area in Addis and the largest outdoor marketplace in the world! As we entered The Grand Market, a strong pungent aroma of incense, spices and hot chili powder overwhelmed my senses. I was thrilled to to see the fast-paced, busy market life of Ethiopian people first-hand. It was like an adrelinalin rush! Inside, one can buy anything from spices, to clothing, to meats and produce and everything in-between! My favorite food while in Ethiopia was the injera, which is a large pancake-shaped substance made from tef, a grain that is unique to Ethiopia and very nutritious. It is delicious! Before going to the market, I was given a traditional Ethiopian receipt to make a gravy dish that goes with the injra. While browsing through the hundreds of vendors and shops within, I bought chili powder and pea powder to prepare the dish and some extra to take back home with me! Every meal I had in Ethiopia was prepared beautifully and the food was more and more delicious with each new dish I tried. I could not wait to make an Ethiopian meal of my own when I returned from my travels. There is something special about the way Ethiopians prepare food. Many of their meals include a spice called berbere. This is also one of the most important ingredients in their national dish, wot. If you like chili and peppers like me, then you would enjoy the meats with gravy and seasoning just as much as I did! We ate all of our meals by hand—the traditional Ethiopian way. Injra is used like a fork. You tear off a small piece to grab the meats and share large platters together. I have never had so much fun, sitting with friends and talking over a meal of such savory flavors. What am amazing country of culture and craft!